We never really believed that availability in a range of colors could ever be the deal breaker when it comes to choosing a new smartphone, but according to a new TV ad from Nokia, it appears to be the case. The Finnish mobile maker has just launched a new ad for its recently-unveiled Lumia 920 smartphone that takes a swipe at the iPhone for its lack of color options. Seriously. The 60-second animation, viewable below, is, until about halfway through, a rather downbeat, colorless affair (yes, it’s all very deliberate), with its nighttime cityscape setting and solemn soundtrack. 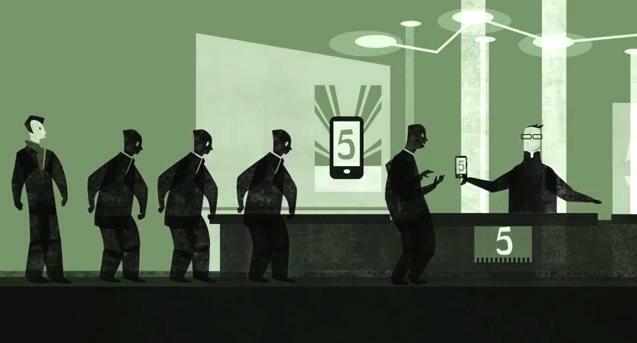 A line of identical-looking people enter what is obviously meant to be an Apple store, hand over their cash and receive a smartphone with a large number “5” showing on the screen. When one customer hesitates to take his new phone from the Apple employee and utters a guttural “color?”, all hell breaks loose, with the employee looking like he’s about to smash up his own store and attack everyone inside it (though he doesn’t, of course). We then cut to the scene outside – yes, the music livens up and suddenly the ad is awash with color as lots of people walk by using their colorful Lumia 920 smartphones. Could it be the case that Nokia based the ad on the results of market research? Did it discover that more than screen size, battery life, photographic capability, app availability, weight and dimensions and overall user experience, it’s the color that matters most? Or perhaps this is just the first in a series of ads from the mobile maker, each one picking on a different aspect of a rival device. It’s certainly an altogether different kind of ad in terms of style and content to Samsung’s Apple-bashing ones for its Galaxy S3 smartphone. But will it be effective? Do you know anyone that bought a smartphone because “I couldn’t get the iPhone in red”? The Lumia 920 was unveiled in New York last month. The Windows Phone 8 device comes with a 4.5-inch screen, a dual-core 1.5Ghz Snapdragon S4 chip and 32GB of onboard memory. It also sports an 8.7-megapixel PureView camera capable of shooting 1080p video, a forward-facing 1.2-megapixel camera, and is capable of wireless charging. But here’s the important bit – it comes in yellow, red, gray, black and white. What do you think of Nokia’s approach to marketing its new phone? Persuasive?